The saying goes that you gotta make hay when the sun shines. Well, I'd like to add my own version: You gotta make gazpacho soup when the days are hot and the tomatoes are ripe! Gazpacho is a traditional chilled soup made by blending the delicious fruits of summer - tomatoes, peppers, cucumbers, etc. There are approximately a million different recipes for gazpacho soup, so get creative and use whatever fruits and veggies you have available (my friend and badass chef + lady boss Kristen Desmond makes a fabulous Watermelon Gazpacho for her gourmet-to-go spot in Santa Barbara, Flagstone Pantry). The real secret is just starting with the best + freshest ingredients possible and to balance your flavors - taste the soup constantly, adjusting the salt and vinegar as needed. The soup should taste seasoned but not salty, tangy but not sour. 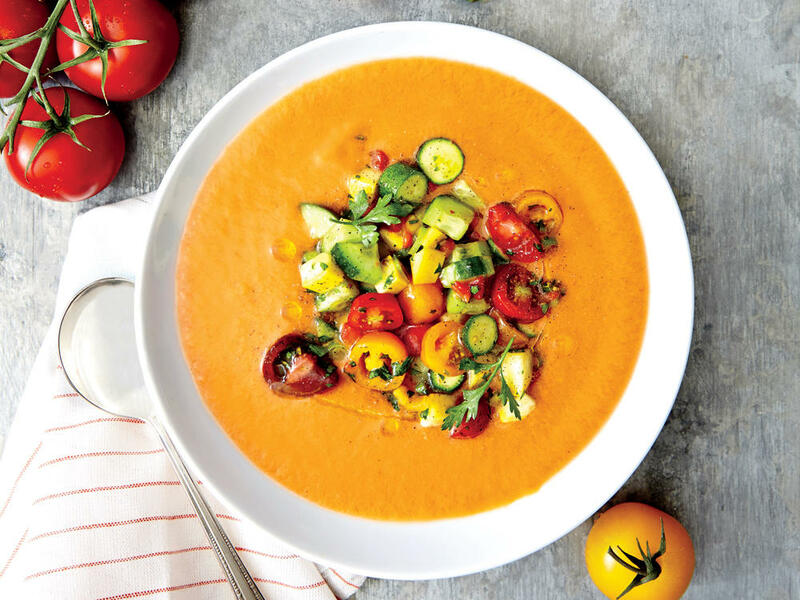 So here's hoping you have a glut of tomatoes in your garden or from the farmers' market, and you can whip up this soup without turning on the oven or stove in your hot summer kitchen. Place a fine-mesh sieve over a large bowl, and strain soup (discard the solids). Make the basil oil: Finely chop basil. Place in a small bowl, and cover with the olive oil. Add the halved cherry tomatoes and a generous pinch of salt. Toss to combine, then taste and adjust salt. Set aside. To assemble, ladle soup into chilled bowls. Garnish with basil oil and additional diced vegetables. Serve immediately.